In the vast world of fashion, it can be easy to get overwhelmed. Bringing some order to the chaos is where the function of a stylist comes in – stylists are there across all platforms where fashion is the protagonist – fashion magazines, clothing boutiques, and day-to-day styling of people. 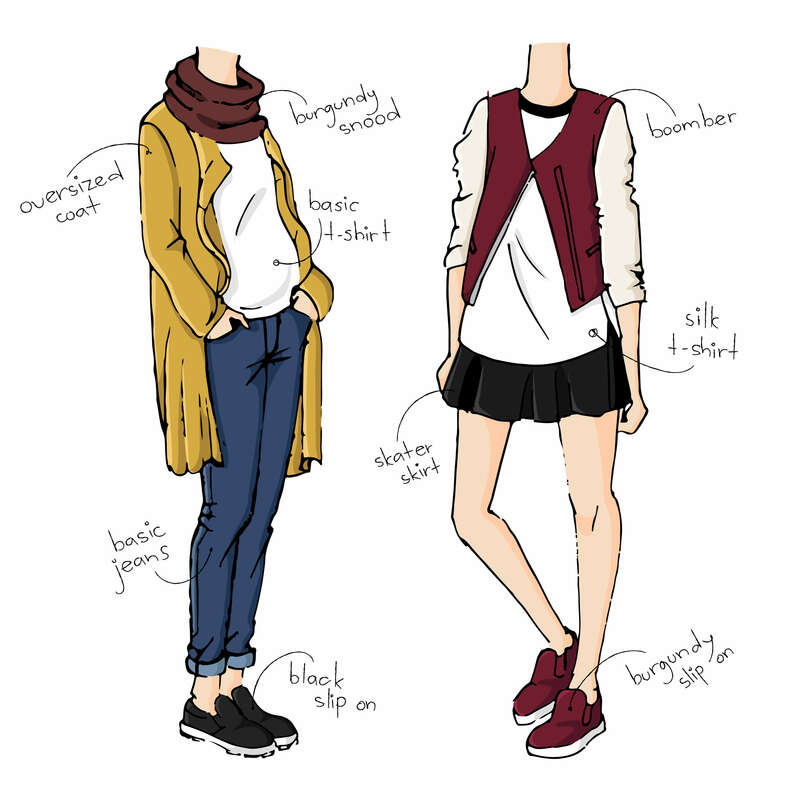 A stylist puts together outfits – keeping in mind fashion rules and the purpose of styling. For fashion magazines, any outfit has to go with the general theme of the magazine and the context of its usage. Styling people depends on a lot of things – the occasion, the cultural/societal context, the brand’s character, and most importantly, the wearer’s personality should all resonate with the outfit. 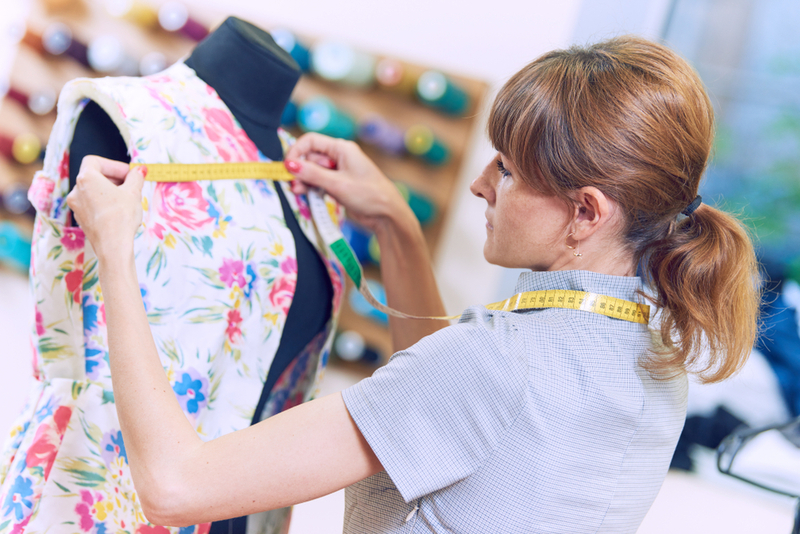 There are two kinds of people stylists – those who are associated with a particular brand and those who are associated with a particular person. The ones associated with brands are usually present as in-store stylists who help either select or aid clients create outfits for their body type and preferences from the selection available. This, while helpful, does not go beyond the realm of what the store or the designer has to offer. The stylist may not understand the client’s personality and predict what they are looking for. The essence of styling here is a little restricted. Stylists associated with people, known as personal stylists, on the other hand, give a more wholesome styling experience. A large part of their job involves understanding their client. The entire styling process is done keeping in mind the personality of the client. However, personal stylists are considered a luxury as not everyone would be able to afford their services. Personal stylists are typically seen as a part of celebrities’ staff. 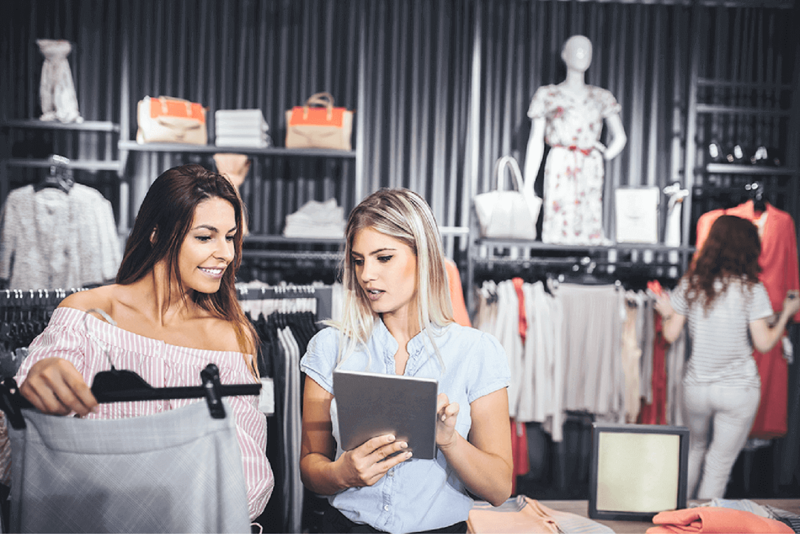 Here is where the role of an AI stylist comes in – the luxury of a personal stylist for each shopper without the exorbitant costs. 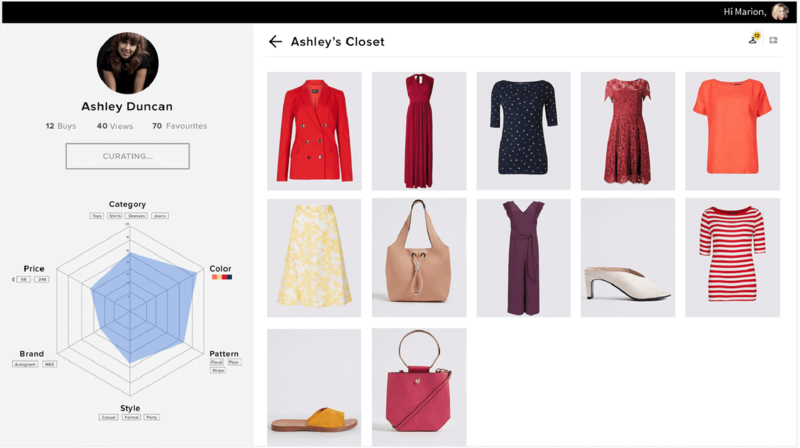 AI stylists, in fashion ecommerce websites bring in a styling and outfitting option for shoppers to see how each piece can be styled. 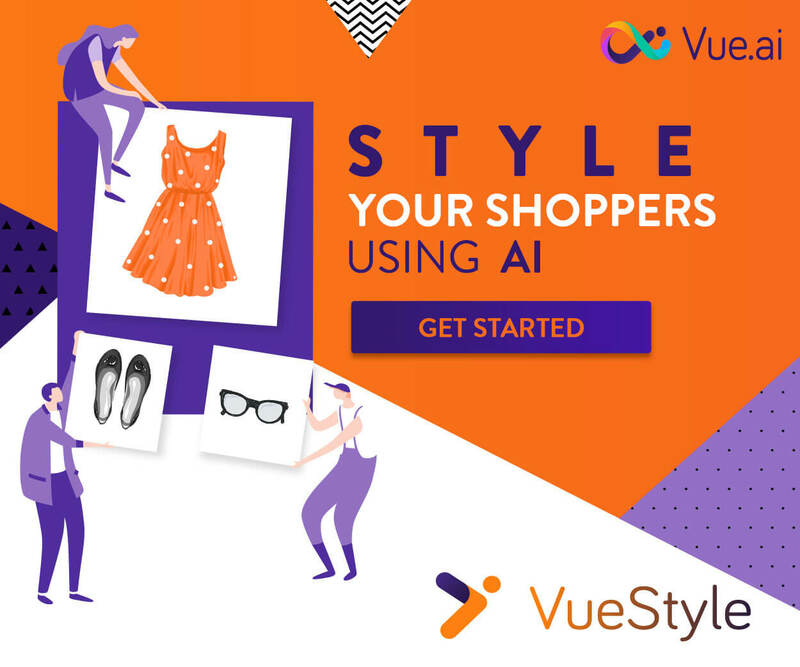 Vue.ai’s AI Stylist, VueStyle, is a smart solution for styling, outfitting, and visual merchandising for fashion retailers. In addition to styling options for different pieces – VueStyle shows different ways of styling an outfit for various occasions – all personalized to the shopper’s preferences. In today’s customer centric retail world, it is all about experience. Personal styling has been an experience that not many parts of society has been privy to. It has always had a luxury tag attached to it. Making this accessible for every shopper in your ecommerce website, brings with it quite a bit of novelty. And like all novel experiences, it is exciting. The shopper wants to see what all the AI stylist has to offer. Seeing the AI stylist show outfit recommendations for different occasions, pick up the shopper’s preferences and tastes, and the huge variety of choices all contribute to what is a very glamorous experience. The flip side of most novel experiences, however, is that once it isn’t as fresh or novel anymore – it tends to get boring – unless really useful. The AI stylist, while being novel, also makes the entire experience very addictive. The shopper gets used to being able to see outfit recommendations and look inspirations for every piece they browse. That is what they want to see everywhere now – a shopping experience doesn’t feel complete without knowing what one can wear with whatever they are buying. If Sarah, a shopper on your website, has gotten used to seeing how she can wear a white peplum top for different occasions, and with different pants, skirts and coats – she would not want to go to another website where no such outfit recommendations are made. The fact that each ensemble is personalised to her specific tastes and preferences only helps further. In addition to being novel, exciting, glamorous, and addictive – AI Stylists can also bring with them a very explorative experience. As a shopper, Sarah might have never thought to pair a solid blue top with striped grey skater skirt – but she gets introduced to this combination on an ecommerce website by an AI stylist like VueStyle, and ends up buying it. Sarah may have not even been aware that she wants that outfit till the stylist throws it up. People’s styling choices are based a lot on various factors. Movies, magazines, fashion icons Instagram pages, fashion boards on Pinterest, and past looks that have worked majorly influence the kind of styling decisions we make – but also limit them to a major extent. One may not be able to think beyond what our different inspiration sources have taught them. AI stylists do not have these boundaries. VueStyle creates multiple ensembles for each without being limited by some specific inspirations while not compromising on style by adhering to fashion and styling rules. The tool inspires the shopper with different ways of styling a product in terms of its own attributes and based on style & occasion. Rules based on style, shape, and colour of the clothes are matched with fashion rules for different occasions – defining the algorithms VueStyle uses to come up with the various ensembles. The inspiration also helps cases where the shopper may like a piece but has no idea of how to wear it. If Sarah, while shopping on your website, finds a blue fringe tank top she really likes, but cannot think of anything she can wear it with – an AI Stylist can help give that inspiration. She doesn’t have to choose against buying the top just because she doesn’t know how to wear it. Your ecommerce revenue is particularly benefited by cases like this – instead of losing a sale of one product because the shopper isn’t aware of how to wear it, you could be selling an entire outfit – the blue fringe top as well as the pants, shoes, and accessories that go with it. No experience today adds value to the shopper if it is not personalized – and personalized to such a specific level for each that it is basically individualized to each shopper. 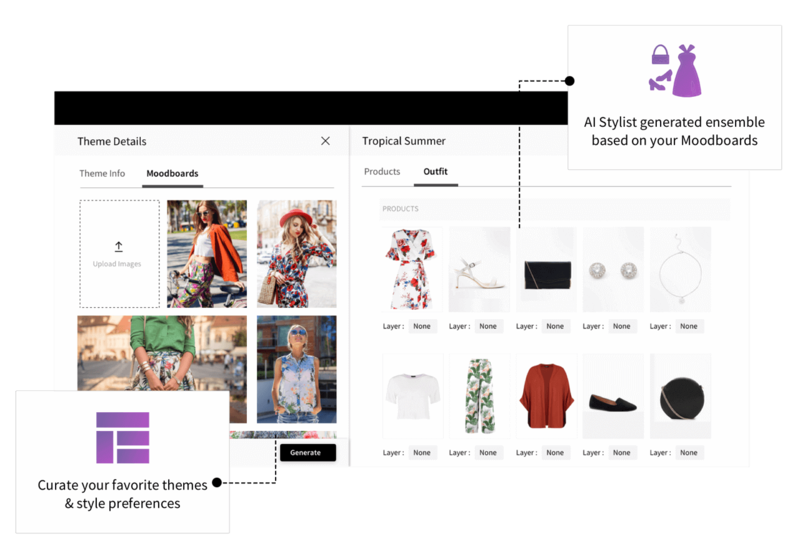 VueStyle is an AI Stylist that is constantly learning what the shopper wants to see. The ensemble options being shown are constantly and consistently adapting to the customer’s preferences by learning in real-time from their behaviour on the site and their interaction with the tool. This makes the stylist truly personal. 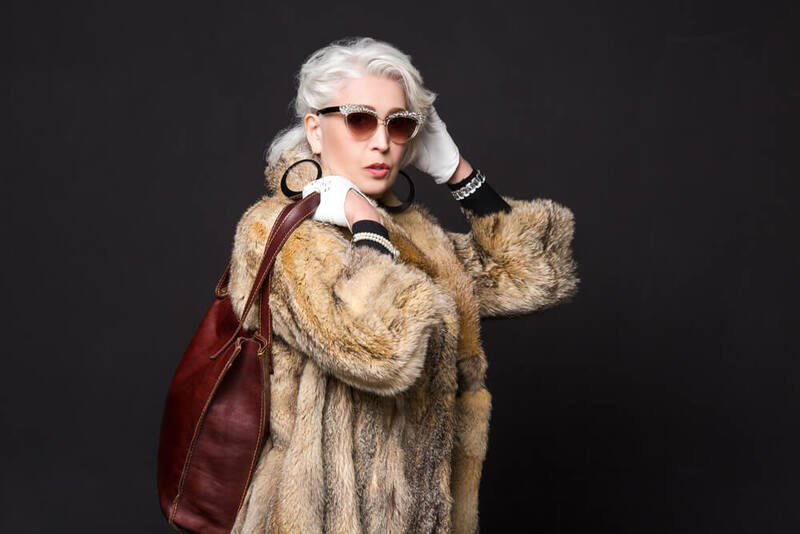 The personal styling experience is complete – without your shopper having to worry about getting options that they will never wear. If Sarah doesn’t like floral prints – the algorithms in VueStyle picks that up based how she has responded to outfits with floral prints in the past. It immediately learns to not show her outfits with floral prints – saving her the frustration of dealing with options that she would never wear. VueStyle takes the personal shopping experience to a new level by bringing it to ecommerce retailers. However, its impact doesn’t end just as an outfitting solution for the different items in your catalog. Visual Merchandising Tool – Visual merchandising is really important to retailers – both in physical stores and online. However, there haven’t been too many reliable ways of efficient merchandising online – VueStyle solves that. By showing various ways in which a piece can be styled – with other pieces from the catalog. This exponentially increases the probability of a shopper buying another product, from a completely different category, while on the page of the original product they viewed. Subscription Box Automation – Subscription boxes have a certain amount of mystery they work around. The element of surprise is a big aspect of the subscription box model. However, this may not always work for the subscriber. More often than not, they may get items that they would never wear or do not like. If put together manually, curation of subscription boxes becomes a full-time job that may not work in scale. You can solve the issue of both personalization and scaling of subscription boxes by automating them by using VueStyle. 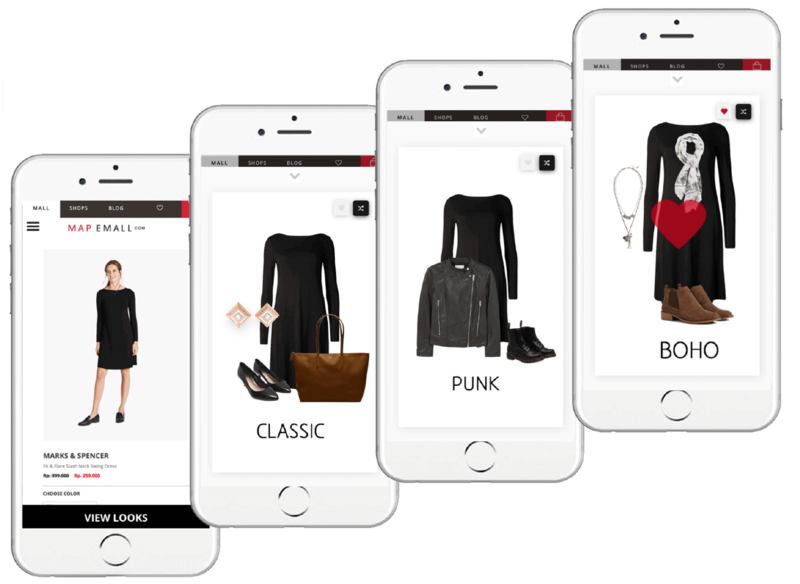 Omnichannel Experience – VueStyle follows your shopper across their journey with your website. Every touchpoint, from category page, product page, and cart, to push notifications and emails has a ‘Style It’ button – with the click of which they can see outfit options for whatever they are viewing. In-Store Clienteling and Personal Shopping – VueStyle can help your retail brand beyond the ecommerce website. 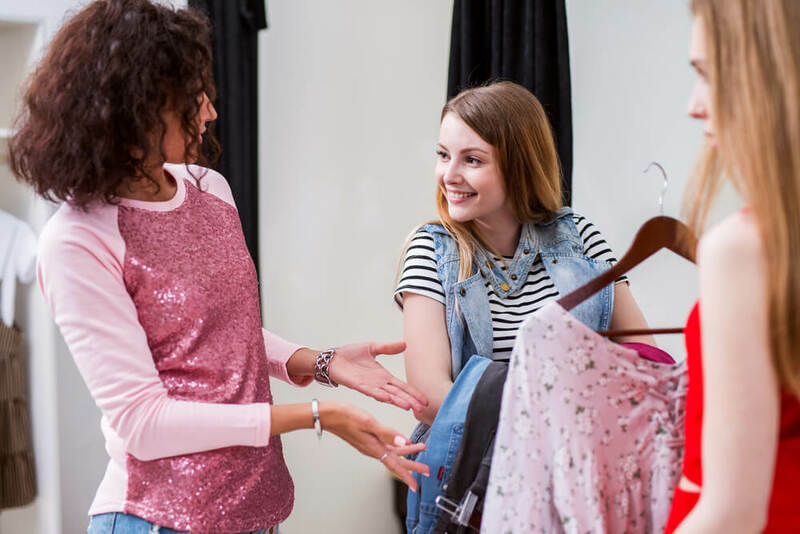 In-store sales associates can provide personalized product and outfit suggestions to every customer based on available inventory and the customer’s style preferences – increasing the personalization levels for styling in physical stores. 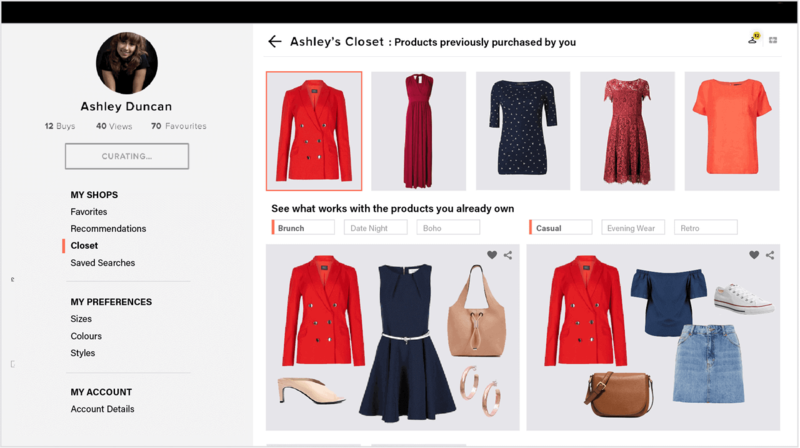 Customer Retention – VueStyle helps build customer loyalty with virtual closets where shoppers can look at previous purchases and mix them up with items in the website. Increasing shopper engagement and time on your site – will lead to retained customers with higher order values. Retailer-specific customizations – You can customize VueStyle to suit your brand better. Create lookbooks, moodboards, and choose occasions based on what you want your shoppers to see. Increased Average Order Values (AOV), improved customer lifetime value (LTV), and an impressively improved customer experience are some of the results VueStyle can offer. This AI Stylist could be the game-changer which can get you to the top. Talk to us about what VueStyle can do for you. 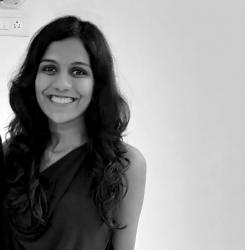 Shradha is a Product Marketer at Vue.ai. Most of her time is spent in reading, eating, and trying to find the perfect dog gif for every situation. She tends to get a little out-of-control in stationery stores. 3What is Computer Vision, Really?